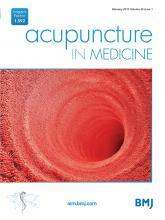 This study explores the underlying mechanism for electroacupuncture and its use in PCOS. The results indicate that applying just one session of low frequency electroacupuncture can reduce blood sugar in overweight women with PCOS. This adds to the mounting evidence that electroacupuncture could be a valid treatment option for some PCOS patients. Conclusions on clinical application will await an RCT. This RCT showed that repeated acupuncture treatments increased ovulation frequency in PCOS patients and abnormally high ovarian and adrenal hormone levels were reduced, compared to controls subjects who had no acupuncture. Larger trials are needed to confirm this result. This systematic review (which is not specific to obesity only in PCOS patients) collected data from RCTs that examined the effect of acupuncture and/or Chinese herbal medicine on nearly 5000 overweight patients, compared with a control group of nearly 4000 overweight subjects. The review reports that in terms of weight loss, acupuncture and Chinese herbal medicine are better than placebo and lifestyle interventions and have similar efficacy to anti-obesity drugs (including Metformin), but with fewer side effects. This review also noted that those who used acupuncture or Chinese herbal medicine to lose weight had a lower risk of relapse. More large RCTs are recommended before recommendations for therapeutic interventions can be made.